It’s a secret that’s been kept for roughly two thousand years, and was revealed by Russian adventurer and journalist Nicolas Notovitch in the 19th Century. This secret was considered so shocking and so heretical that it was shut down and left to die in the wasteland of fundamentalist obscurity. 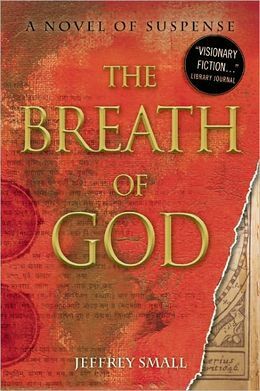 In his novel, Breath of God, Jeffrey Small re-investigates Notovitch’s claims and, explores what would happen if someone actually finds irrefutable proof that Christ had indeed studied Buddhism during those so called ‘lost years,’ of his youth. Through the eyes of grad student Grant Matthews, Small takes us on a spectacular journey to Bhutan, where the legendary Issa texts are kept hidden away in a monastic tower, but are whisked away as soon as the senior monks find out that he’s seen them. He travels home with video proof of the texts only to find the preacher of a megachurch ready to discredit him and his work on nation wide television. What happens next takes the reader through an international search for the Issa texts, all the while being stalked by a fanatical former Special Op’s soldier who is determined to destroy the texts and everyone who gets in his way. This is the best work of fiction I’ve read in a long time. Fast paced, breath taking in scope and powerful in presence, this book is the perfect summer read. I can’t wait for Small’s next book to come out.